Four new factories will be built in capital Kabul with $12 million and 150 million Afghanis of investment by the private sector. 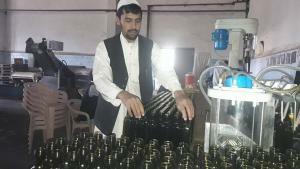 The Ministry of Agriculture, Irrigation, and Livestock (MAIL) said Saturday that the new factories will be built in Bagrami district of Kabul. According to a statement by MAIL, the factories will mainly operate in agriculture and livestock sectors. The statement further added that the factories will process agricultural products, oil production, and food stuff for the chicken farms. The factories will be built in a complex type structure and around $12 million along with 150 million Afghanis will be invested by the private sector. The Ministry of Agriculture, Irrigation, and Livestock is optimistic that the exports of the agricultural products will increase besides helping the domestic requirements once the factories start operations. According to MAIL, the factories will also provide job opportunities for around 800 people once they become operational. The Afghan markets are mainly dependent on imports as the government has stepped up efforts to boost the domestic production in a bid to reduce the dependency on foreign markets and increase domestic revenue by boosting the exports. In the meantime, the investors involved in the plan for the establishment of the new complex are saying that they are investing in the new agricultural factories after they were encouraged by President Mohammad Ashraf Ghani.